First Bank Richmond is celebrating IU Day on Wednesday, April 10, with a $10,000 matching gift opportunity for alumni and friends of the campus. First Bank Richmond and IU East students celebrate IU Day. First Bank Richmond will match – up to $500 per donor – up to $10,000 in total giving to the IU East campus. Now in its fourth year, IU Day is a 24-hour worldwide celebration of Indiana University. IU Day is a social-sharing, IU-wearing, gift-giving day of engagement as students, alumni, faculty, staff and friends of the university come together in celebration of all things IU. Paula Kay King, director of Gift Development at IU East, said First Bank Richmond has the tradition of celebrating IU Day each year with a matching gift. 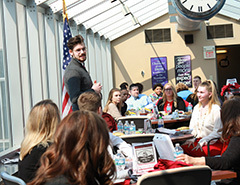 IU East students connect with Indiana University and IU East alumni during a luncheon on IU Day. As another part of IU Day, First Bank Richmond will host a special luncheon for IU East students. During the luncheon IU alumni working at First Bank Richmond connect with the students and share information on the banking industry. Students also have an opportunity to share how their experience at IU East has helped to prepare them for graduate work or profession of choice with the First Bank Richmond team. Gifts can be made at iue.edu/iuday or to the Office of Gift Development at IU East located in Springwood Hall.